Morro Bay, CA – It was California’s written driving test. Pass it and I would continue to drive. Fail it and I would be grounded. Imagine! Well, I did pass it but by just a hair. In fact, this was a retake. I flunked it the first time. So humiliating! What anxiety that created! The tutorial. Notice how it’s dog-eared. That says a lot. Now consider the following. With 20 years of formal education behind me – kindergarten through graduate school – I’ve never, never passed a test with less distinction. I knew sure some people taking it had just a GED – you know, a general equivalency diploma because they never graduated from high school — and were passing it on their first try. Yes, embarrassing! As most of you know, I now live here in California. California says I must now have my Hyundai Sonata with Connecticut plates registered in California. Well, I did that. I also must have a California driver’s license, this though my Connecticut license was good till 2023. No ifs, and, or buts. Registering my car here turned out to be a snap. I had to buy California insurance coverage. That was a must. I got several quotes. An AAA policy turned out to be the best deal. And through AAA I could also arrange to register my car at their local office instead of at a CA Department of Motor Vehicles office. That cut through what I was sure would be much red tape. Unseasoned drivers here must pass a behind-the-wheel test with a CA DMV examiner aboard. But as a licensed driver, I would be spared that. All I had to do was pass the written test. No problem. Or so I thought. After all, I have been driving for more than 70 years. I just did a quick calculation and have figured I’ve driven more than a million miles. Maybe two! Have lost track of my many cars. I have crisscrossed the USA time and again. Have driven through five provinces of Canada. Some 15,000 miles through Mexico. In half a dozen countries in Europe. I taught my wife-to-be to drive. Also my three children. I’m proud of their skill. In all those years behind the wheel, I’ve had a few accidents. Of course. Remember, some of that mileage was through snowy and ice-slick winters. A lot on tough roads and in tricky situations. But never an injury to myself or another. And never have I been arrested. Nobody manages that without a lot of good luck. Still, I do have hefty bragging rights. Not that I took the challenge of the written test lightly. The tutorial for it covers 114 pages. I went through the tutorial page by page. Made notes of tricky items. Plus the DMV offers a number of online practice tests. I took every one. Then off I went for my appointment to the local office in San Luis Obispo, the county seat 15 miles south. And brought all the requested paperwork. It included my birth certificate, proof of my residence here, my current driver’s license and a few additional docs just in case. And my credit card in my wallet. Every possible situation gets explained. The wording of some questions is a problem. the handicap spaces were occupied. The only space I finally found seemed 75 yards away. That’s a challenging walk for me now, even with my walking stick. I made it inside. It was jammed. More than a hundred customers, I estimated. Long lines. Nearly every seat in the waiting area was taken. This will take forever! Not so. I was lucky. Thanks to my obvious old age, I got red-carpet treatment. All senior citizens get it, it seems. Well, decrepit ones. I was directed to a special desk just for us. A pleasant young woman got me through all the formalities. Took a thumb print of me – not the finger-printing of all 10 fingers that I went through when applying for my Peace Corps service—on an electronic gizmo. Just my right thumb. And in a minute she had my whole file up on her computer. She scrutinized all the documents I had brought. No problem. That was a relief. She asked if I wanted to be registered as an organ donor. I said yes. My license would show that also. What I was applying for was a Class C license. That’s the usual license for most drivers. There’s also a Commercial License and a Motorcycle License and several others. Now for the test. An assistant ushered me to a computer and showed me how I could warm up on it with a few sample questions. I was uptight. Definitely, absolutely I wanted to continue driving. Giving it up was unthinkable. But I felt I was ready for the test. I started it in earnest. I got questions one, two, three, and four right. This will be a snap. After my fifth question, “Error!” What?! I thought I had answered it right. I continued. I was doing fine again. But after my ninth, ”Error!” What?! I began reading every question twice, three times. In all my schooling I had graduated from every phase with honors. I wanted to “graduate” from this with honors. Well, on I went. Then ”Error!” And another. My confidence soured. I wound up with seven! Awful. The whole test had taken just 15 minutes or so. But not all was lost. The computer reset again. I found out I could take the test again. Right now. I started again. Proceeded with the greatest care. I’m embarrassed to tell you so, but I failed this one also. I was shocked. Appalled. At the desk I was told, no problem. “Just come back and take it again.” I drove home in a very dark mood. I decided I’d do the re-take in three weeks. I had other important things to do. And I wanted to ace the test the next time. So of course I went through that tutorial with a fine tooth comb. And the online sample tests also. But suppose I fail again! That thought kept coming up. Suppose I fail again! Even in bed at night. Sppose I fail again! What will I do then? I consoled myself. It won’t be the end of the world. Heck, no! After all, I still had my completely valid Connecticut license. My daughter Monique and her hubby David at times took me along on their shopping trips. They’d be glad to expand that, I was sure. I could keep my car and find somebody to drive me, for pay. Truth its, these days I did all my routine “driving” on my trike. I lived close to downtown. Used my trike every day – pedaling to the library, the post office, the supermarket, the coffee shop, on and on. Pedaling was great exercise. In fact, the only real exercise I got now. And great fun. Sometimes I’d go a whole week without starting my car! And a friend came up with a terrific suggestion. “John, use Uber” I’m sure you’re familiar with that—the taxi service provided by ordinary men and women using their own cars. You summon one with an app on your computer or cell phone. A brilliant idea, I thought. Kept it in mind. Finally decided I wanted to keep on driving. A driver’s license spells independence. Freedom. And I felt my honor was at stake. All I have to do is pass that damn test! I got back to work on that tutorial and the sample tests. One of the problems, I was convinced, was that the testing has little relevance to everyday driving. 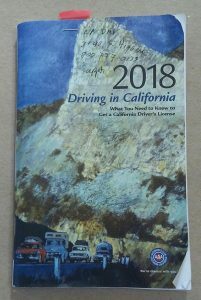 Many drivers – most, I dare say –go on and drive with little knowledge of and little respect for the fine points made by California DMV. Do we really have to know that anyone over 21 found with an alcohol level of more than 0.08 percent is in big trouble? And under 21 with a level of more than 0.01 ditto? Of course not. All we have to know is that a suspicious police officer can insist we take a sobriety test. And if we fail it, trouble indeed! The whole point being that it’s risky to drive and drink, and much smarter not to drink. Do we really have to know that the only vehicle that must stop at a railroad crossing is a truck carrying hazardous materials? All others must slow down, look left and right, and never attempt to cross if they see something on the tracks or just beyond it preventing complete passing. That if we abandon an animal on a highway we can be fined up to $100? Even also be sent to jail for up to one year? No. All we have to know is that doing that is illegal and we will be be fined severely. Do we really have to know that we must pass a bicyclist in a bicycle lane by at least 36 inches, and not the other margins mentioned as a possible answer. No. Just that we make sure to pass safely. That the most dangerous time to use our brakes is not during a routine rain, but when a rain just starts? No. What’s important is that we must slow down and use extra caution. I studied hard. Returned for the re-take. Felt I knew the material cold. Surprise, the clerk asked me if I wanted to take the paper test or the computer test. I had thought every test was on the computer. “Which is easier?” I asked. “Paper,” she said. “I’ll do paper,” I told her. She sat me down at a table and handed me the test. Same format. A question and then three choices. Check the proper one. But no “Error!” warning now. I was confident of my answers except in three questions. I re-read them. Still I was unsure. Just because of their working. They were ambiguous. Whoever composed them never got an A in logic or sentence structure. Bottom line: I got four wrong, so I passed! But I was disgruntled. I went to a clerk and insisted on seeing my mistakes. Upon examining them I concluded I could make a righteous complaint that three of my answers were valid. So I did ask to speak to a supervisor about those questions but was told , “Impossible, sir! You have to get in touch with Sacramento.” Sacramento, as you know, is the state capital. She gave me a form to fill out and mail. I took it home. Maybe I will. I have sound objections. I would like to argue my answers were correct. But maybe I won’t. It probably wouldn’t change a thing. Finally I asked to take my graded test home. I already I knew I would blog about this experience. I could include the exact wording of those troublesome questions and my answers for you to decide for yourself. “Sorry, not allowed,” she told me. Of course! Because I could have made a bundle selling them to people worried about passing the test! And oh, before I was handed my new license, I was asked for my Connecticut license, yes, with still four full years left on it. The clerk punched three holes in it. Remember how I thought I could continue driving with that license if I had failed the California test? Not so. That would have been illegal. Well, I’m saving it as a souvenir. Then a nice surprise. I had my credit card out to pay for my retake. “No, no,” she said. “You paid the last time.” I smiled – my only smile during the entire miserable experience. I was joyous on my ride home. Joyous – that’s the right word. But my “errors” rankled. And extremely careful now how I drove. The experience did teach me the importance of safe driving. I’m serious. I drove more carefully now. 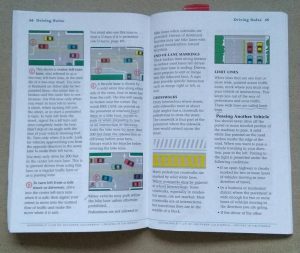 Strove to drive exactly as specified in the tutorial. The fact is, I did not have a right to drive. I had a permit to drive! I had forgotten that. At the same time I was amused by how many drivers on the road with me were routinely and blissfully ignoring the legalities they had to know to get their license. Scandalous! DMV officials must go nuts observing this when they are out driving routinely. Yes, I lost a lot of sleep over that test. But given my age it is sure I’ll never face another. Ever. A nice thought. Comforting. But not so nice in another way. As always, I look forward to your comments. Thank you in advance.